Sealaska Heritage Institute (SHI) will publicly unveil three exquisite bronze house posts, which will be on prominent display outdoors on the corner of Front and Seward Streets by the Walter Soboleff Building in Juneau. The posts were made by three emerging master Tlingit, Haida and Tsimshian artists— Tlingit Stephen Jackson, Haida TJ Young and Tsimshian David R. Boxley. The resulting works are absolutely stunning to behold, said SHI President Rosita Worl. 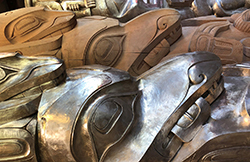 The bronzes will be juxtaposed against the three monumental Tlingit, Haida and Tsimshian pieces at the building made by master artists Preston Singletary, Robert Davidson and David A. Boxley. The cedar posts upon which the bronzes were based also will be on display at SHI and later erected on the waterfront side of the Sealaska building. The project is part of SHI’s goal to make Juneau the Northwest Coast Capital of the world and to designate Northwest Coast art a national treasure. The ceremony is scheduled at 1:30 pm, Sunday, Aug. 26. The ceremony will be broadcast live on SHI's Facebook page. Everyone is welcome. The post by Young depicts the image and story of Wasgo, a supernatural figure in the Haida culture known for having the power to successfully hunt killerwhales. “I’ve illustrated Wasgo mid-hunt with two killerwhales clenched in his teeth. The third killerwhale has temporarily eluded Wasgo and rests on top with his pectoral fins tucked inside Wasgo’s ears,” Young wrote. The post by Polys highlights aspects of the feminine and maternal character not as often depicted in carved form. The post depicts the complexity of the way in which Tlingit culture places value on feminine strength, Polys wrote. “The matrilineal passage of moiety is mirrored in the mother's passage of Raven into the human world, reminding us of women's ability to connect us to the power of the natural and supernatural, the power of the sun, to generations past and future. Only by being her son could Raven be granted access, only she can bestow it. She is who allowed for his birth in human form, and despite Raven’s continual peregrinations, she holds the most honored place with the most power,” he wrote. The post by Boxley depicts Txeemsm (Raven), the mythical hero of ancient Tsimshian stories. Above Txeemsm are four human figures that represent the clans or phratries of the Tsimshian,” Boxley wrote. “Txeemsm’s importance to our people cannot be understated. We literally and figuratively stand on his accomplishments. The vast majority of classic Tsimshian style poles and posts depict primarily human figures, featuring the iconic Tsimshian cheek pyramid and rows of interlocking human figures,” Boxley wrote. TJ Young was born into the Yaadaas Eagle Clan of the Kaigani Haida in 1981 and was given the Haida name Sgwaayaans. Raised in Hydaburg, Alaska, TJ cites his grandfather Claude Morrison, as a major influence in his life. Claude introduced him to Haida art and practices when he was a teenager, instructing him on how to hand-carve halibut hooks. TJ creates many carvings and items for ceremonial and cultural purposes and considers it an honor to carry on the traditions of his ancestors. TJ continues to develop his skills. In 2010, he graduated from the Native Education College Jewelry Program and learned the basics of engraving from Dan Wallace and James McGuire. He had the privilege of working under world-renowned Haida artist Robert Davidson from 2012-2015. With his brother, Joe, TJ carved two poles at the Gajaa Hít Building in downtown Juneau, as well as an Eagle pole at the University of Alaska Southeast in Auke Bay. During Celebration 2018, he was awarded the Best of 2D & Relief Division and Best of Relief Carving awards for his piece Hlats’ux (Northern Lights), among other honors. Stephen Jackson, also known as Jackson Polys, is a visual artist who lives and works between Alaska and New York. His work reflects examinations into the limits and viability of desires for indigenous growth. He began carving in Saxman with his father, Tlingit artist Nathan Jackson, from the Lukaax.ádi Clan of the Lkó̲ot K̲wáan. He was adopted into the Daklʼaweidí Clan of the Jilkáat K̲wáan and worked as a visual artist as Stephen Paul Jackson and Stron Softi, with solo exhibitions at the Alaska State Museum and the Anchorage Museum. He received a B.A. in Art History and Anthropology and an MFA in Visual Arts, both from Columbia University, where he taught from 2016-17. During this time he was Advisor to Indigenous New York, the collaborative program initiative co-founded by Mohawk artist Alan Michelson and the Vera List Center for Art and Politics. He is recipient of a 2017 Native Arts and Cultures Foundation Mentor Artist Fellowship. His individual and collaborative works reside in collections at the Burke Museum, City of Ketchikan, City of Saxman, Field Museum, Goldbelt, and the Übersee Museum-Bremen. His art has been exhibited at Artists Space, Hercules Art/Studio Program, the James Gallery, Ketchikan Museums, and the Sundance Film Festival. David Robert Boxley, the eldest son of renowned Tsimshian carver David A. Boxley, began carving under the instruction of his father at six years old, and around the same time began to travel around the United States to assist his father in raising totem poles and teaching people about Tsimshian culture. As an adult, he has continued to express the love and respect he has for Tsimshian culture through his art, teaching and cultural performance. With his father, David A., David R. created the Tsimshian house front in the foyer of the Walter Soboleff Building. David R.’s entry in SHI’s 2016 Juried Art Show & Competition won four different awards, including Best of Show, and Best of Formline. In addition to carving full-time, David R. teaches Sm’algyax (Tsimshian language) and Northwest Coast design, and performs with the Boxleys’ dance group, Git-Hoan Dancers, throughout North America. ​Sealaska Heritage Institute is a private nonprofit founded in 1980 to perpetuate and enhance Tlingit, Haida and Tsimshian cultures of Southeast Alaska. Its goal is to promote cultural diversity and cross-cultural understanding through public services and events. SHI also conducts social scientific and public policy research that promotes Alaska Native arts, cultures, history and education statewide. The institute is governed by a Board of Trustees and guided by a Council of Traditional Scholars, a Native Artist Committee and a Southeast Regional Language Committee. CONTACT: Kathy Dye, SHI Media and Publications Specialist, kathy.dye@sealaska.com or 907.321-4636. Caption: Portion of bronze and wooden house posts by TJ Young. Photo by Preston Singletary, courtesy of Sealasksa Heritage Institute. For a high resolution image, contact kathy.dye@sealaska.com.